SN Security is a device intended for land owners. You protect your land against unwanted visitors, visitors who cause lag by attaching way too much to their avatar and visitors with crash and griefer tools. SN Security scans all your visitors and acts on those who do not comply to the limits you defined. Avatars which are too complex, have too many prims, come with an immense render weight, and so on. You define what happens with those in violation: A warning? The device warning you? Or kick them out. When kicked out, they are teleported home and banned for 3 minutes. The ban is needed in order to avoid griefers from teleporting back in within seconds. SN Security scans all your visitors, during their entire visit. You can whitelist people you trust, all others have to be within the limits you specify. If not, SN Security can send them a warning, send you a warning and/or eject the avatar. An ejected avatar will be automatically banned from your parcel for 3 minutes. The avatar does get a message about why he is ejected. He can adjust himself and safely return. You reduce lag and you protect your visitors and your business from bad guys with bad tools. SN Security itself is a single script which scans the present avatars. It consumes little resources of your region. The script takes fluctuations caused by the server, in e.g. script time, into consideration before acting on your visitors. When someone is kicked out it is pretty sure that this is not by mistake. 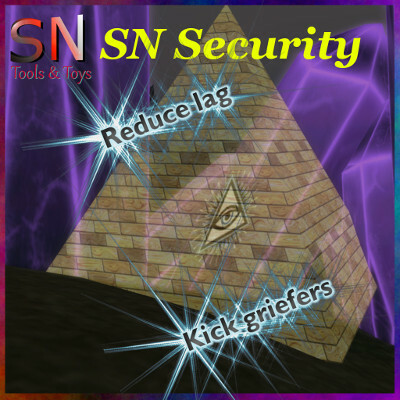 You can use the logs of SN Security to determine who might be the visitors you have to keep an extra eye on. You can configure SN Security in great detail. When only fighting griefers you might configure it allowing more prims, more render weight, more scripts etc, when also fighting lag you can reduce these settings keeping also these avatars out that mean no harm, but cause it nevertheless. The config notecard contains all explanation you need in order to set up SN Security to fit your situation. Protect your land, keep your visitors safe and reduce avatar-caused lag with SN Security. Simple, easy and you stay in control!